Charming odes to traits like Grandmas center of warmth and Grandpa's inner curmudgeon. Celebrating the full picture of "grand" life, these mugs feature Sandra Dumais' playful heart illustrations that offer refreshingly honest looks into nana- and pawpaw-ism. Inspired by her own experiences as a parent, Sandra hand sketches, paints, and digitally draws a narrative interplay of words and images. The result: odes to traits like Grandma's center of warmth and Grandpa's inner curmudgeon that make positively charming character studies. Mugs made in China. Decorated in Edina, Minnesota. Click to view the artwork for Grandpa and Grandma. Looking for more of the family? 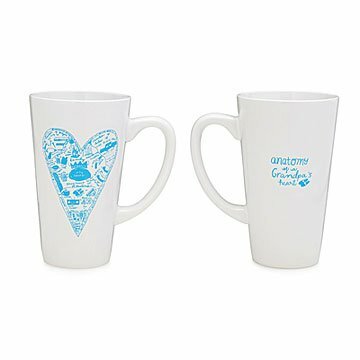 Click to see our Anatomy of a Parent's Heart Mug, Anatomy of a Sister's Heart Mug, and Anatomy of a Best Friend's Heart Mug.